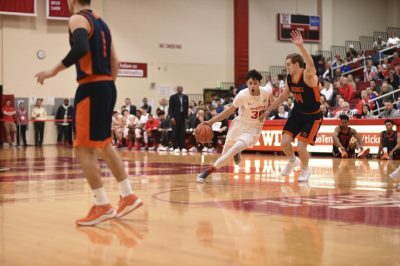 In the Boston University men’s basketball team’s first go-around of its Patriot League competitors, it posted a 7-2 record, which included a win over Bucknell University on the road — a feat no other team in the conference has been able to achieve. However, when facing their league opponents again, the Terriers (12-15, 8-8 Patriot League) have found little success, being unable to complete a regular season sweep of any squad. On Saturday afternoon, the same pattern ensued as BU fell to the United States Naval Academy 62-48 on Senior Day, pushing its losing streak to five games. This was the lowest offensive output the Terriers have put up throughout the entire 2017-18 season. When the Terriers faced off against the Midshipmen (19-10, 10-6 Patriot League) last month on the road, they brought a 75-68 win back to Boston. Although Saturday’s matchup at Case Gym played out much differently. Navy had five of its nine players reach double digits in points while senior guard Cedric Hankerson and sophomore forward Max Mahoney finished with 11 and 10 points, respectively, for BU. The Terriers started the game strong, with a 5-1 lead after a three pointer from Hankerson and a layup from sophomore forward Tyler Scanlon. BU was able to maintain this lead throughout the first 11 minutes of the game until Navy tied things up with a pair of free throws. Over the first half, the Terriers had eight fouls, giving way for the Midshipmen to go 7-for-11 (63.6 percent) from the charity stripe. Navy gained a lead with a speedy 12-2 run. Hankerson noted that the team has been struggling keeping a consistent level of intensity during its current skid. In this span, BU continued to struggle with turnovers. The Terriers turned over the ball 16 times throughout the entire contest and the Midshipmen garnered 16 points from those. Navy led by as many as 11 points with 2:27 remaining in the first half, but BU chipped at the lead with a pair of threes and a free throw to cut the score to 31-26 at the half. In the second half, the Terriers struggled against the Midshipmen’s defense. Navy entered the matchup leading the conference and No. 39 in the nation in scoring defense, limiting its opponents on average to 66.3 points per game. BU took a momentary one-point lead after a three pointer from junior guard Kamali Chambers. However, a jumper from freshman guard Cam Davis with 16:32 minutes left in regulation would give the Midshipmen a lead they would not surrender. Freshman guard Javante McCoy made a few solid drives for the Terriers, but BU was unable to gain any offensive traction and went 8-for-24 (33.3 percent) from the field during the second half. The combination of junior guard Hasan Abdullah, junior forward Mo Lewis and senior guard Bryce Dulin proved deadly as they helped the Midshipmen secure a 60-44 lead, their largest of the game. Chambers netted a layup off a fast break in the waning minutes of the contest and McCoy tallied another two points, but the Terriers fell 62-48. Jones commended Chambers’ hard work that was present throughout the game. Jones noted that moving forward the team needs take responsibility.